One of Waterhouse's greatest master pieces is Saint Cecilia, patron saint of music, lying asleep in a chair. Two angels kneel by her side, both playing stringed instruments. The angels as well as Cecelia herself share a look of gentle innocence and vulnerability (which Peter Trippi compares to the Nymphs in much King Hylas and the Water Nymph). The angels look at Cecelia admiringly for her strong faith and lasting virginity. The book in her hand is most likely the holy gospel which the actual saint always carried concealed from her non-Christian family. Saint Cecilia is considered to be one of the Catholic Church’s greatest martyrs. She converted many to Christianity which eventually cost her her life. She was ordered to be suffocated by steam, but survived and was found smiling inside the chamber. She was then ordered to be beheaded, but the executioner could not sever her head with the three blows allowed. She supposedly survived for three days, throughout which she was said to be fully coherent and joyful. She finally died after being blessed by the holy Pontiff Urban. (Catholic Encyclopedia) (Magnificat) Saint Cecelia currently holds the world record for a 19th century Victorian or non-Impressionist work, sold at auction, selling in the summer of 2001 for 6.6 million pounds, or roughly 10,000,000 American dollars. waterhouse Saint Cecilia Beautiful, original hand-painted artwork in your home. Interpreted paintings based on the masters' works of John William Waterhouse.This waterhouse Saint Cecilia needs about 14 - 16days for production by a talented artist. If you're not happy with John William Waterhouse waterhouse Saint Cecilia that you made on PaintingHere.com, for any reason, you can return it to us within 50 days of the order date. As soon as it arrives, we'll issue a full refund for the entire purchase price. Please note - PaintingHere.com does not reimburse the outgoing or return shipping charges unless the return is due to a defect in quality. If you want to purchase museum quality waterhouse Saint Cecilia at discount price, why not give us a try? You will save a lot more! This John William Waterhouse waterhouse Saint Cecilia needs 14 -18 days for production time frame. We ship all over the world. 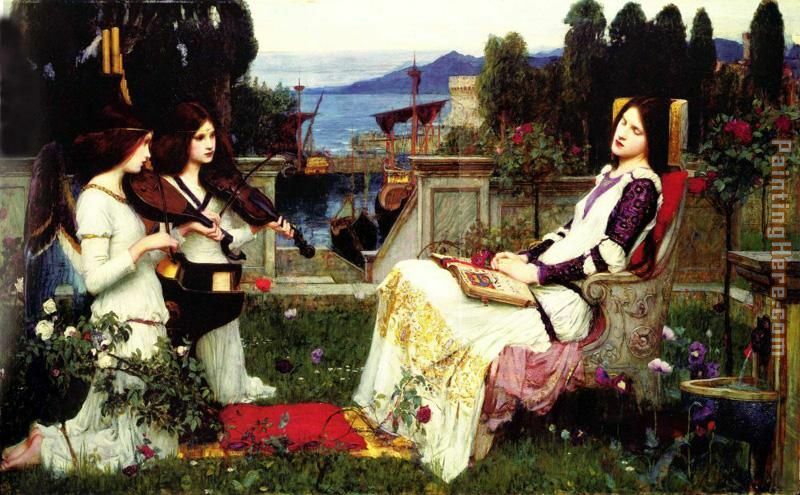 We can provide waterhouse Saint Cecilia Painting stretched canvas and large framed art.